For years I’ve been afraid of competing. It is easier to harbour delusions of athletic talent if you never test them. Being injured actually gave me an excuse to sign up for a race. I felt that I could cope with mediocrity if I could claim (mostly to myself) to be an off-the-couch cripple. Admittedly, nearly two months after abandoning my crutches, I’m getting less and less sympathy in the cripple department. Nonetheless, I’d never done a ski-mountaineering race before and had no idea what I was doing, so I figured that entering the Dogtooth Dash in Golden was an experiment my ego could handle. 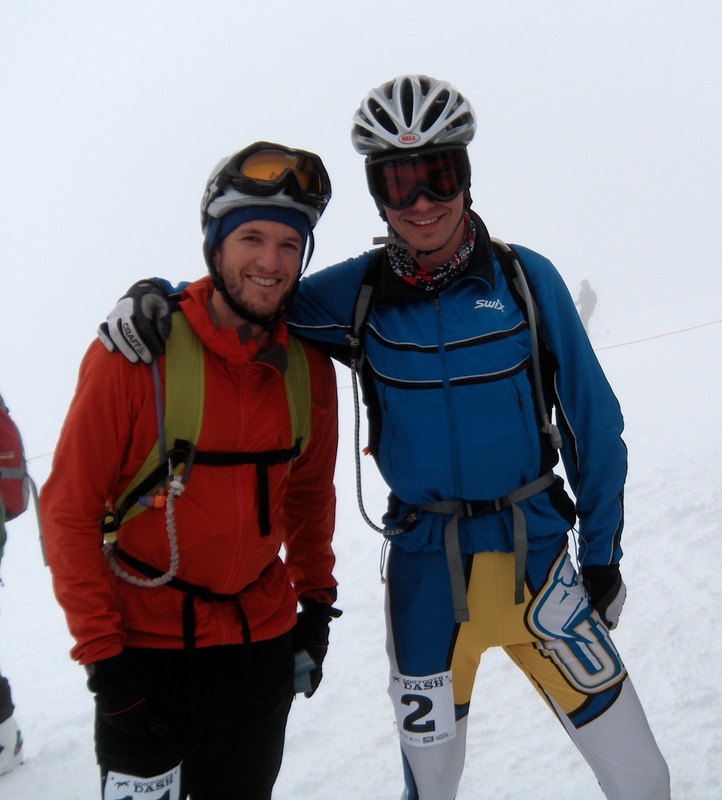 The whole thing was also made more attractive by the fact that I could combine the race with some ice climbing in the rockies. 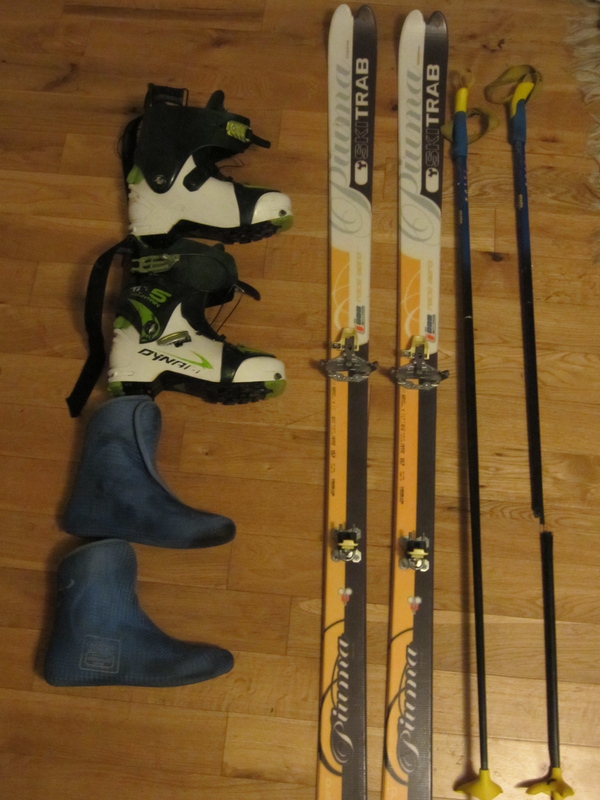 Gear: Dynafit TLT5 Mountain boots, Intuition Denali Liners, Ski Trab Race Aero skis, Dynafit Low Tech bindings (older model), and Exel fiberglass poles. None of it quite top-of-the-line, but all of it good enough that I can't blame it too much for my shortcomings as a skier. In short, the race was a lot of fun and I didn’t embarrass myself too much. I was eighth overall, and although I was miles behind the top two racers, I felt like I was generally competitive with a group of competent racers (and one elite woman) for most of the course. What follows are a few thoughts on the race; probably only of interest to my future self should I do another one. • Transitions matter. I practiced taking my skins on and off while skiing to Red Heather a few days before the race, but I really wasn’t very concerned about losing a few seconds in transitions here and there over the course of two hours of skiing. However, the race contained roughly 15 transitions, so not only did the seconds begin to add up, but again and again I was demoralized to arrive at a transition at the same time as another skier only to leave with a 20 meter gap to close. Besides being generally slow, I also made a couple of rookie mistakes in the transitions. On the second climb, I didn’t attach one of my skins properly and it soon fell off, forcing me to stop and reapply it. At the top of one of the boot-pack sections, the transition was in a rather precarious spot. I ripped the skins off my skis before putting them down on the snow which made stepping into the bindings a very delicate and slow procedure so as to avoid kicking my skis off the ridge. 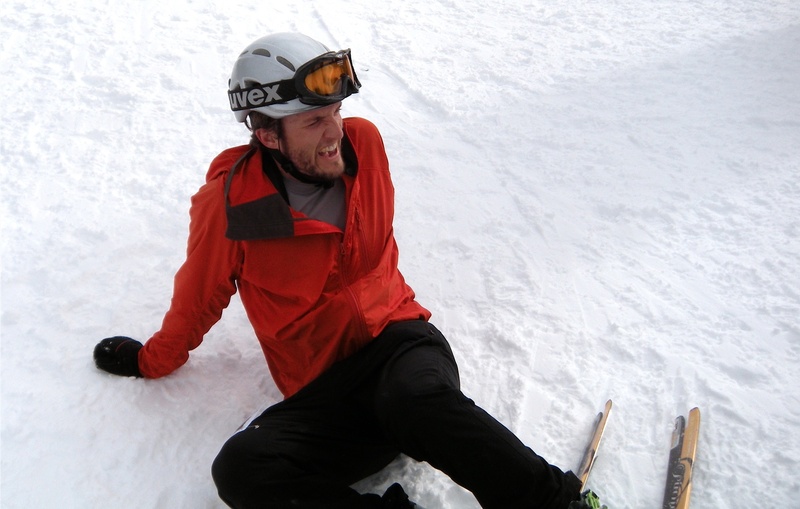 • I strongly believe that ski-mountaineering races should be as technical as possible (I suspect that liability is the limiting factor in North America); otherwise you may as well be cross-county skiing. The race in Golden had a few challenging descents where the snow was a bit variable and choppy. On one of these, about two-thirds of the way through the race, I crashed and broke a pole. I’m not sure how much less efficient it is to ski with only one pole, but it was certainly a blow to my morale at a critical point in the race. I noticed people using a variety of different types of poles, but in the future I think I would use light aluminum ones if I thought I might fall on any of the descents. Just after crossing the finish line. • I finished with a time of 2:25. During that interval I ate two gels and drank about a liter of water (I carried five gels and 1.5 liters of water). It’s something that requires further research, but I suspect I would have done well to eat and drink a bit more. After breaking my pole, I felt as though I was suffering and slowing down quite a bit on the final two climbs. No doubt my pacing could have been better, although I really did feel relaxed and comfortable through the first half of the race. I feel that I bonked at the end of the race partly due to lacking a solid aerobic base (1.5 months ago I was in the worst shape of my life), partly from not taking on enough water and gel, and partly from a lack of mental toughness that comes from racing experience. • I was pleased to be the first non-lycra-clad finisher. Unfortunately, I was way overdressed and I can now see the benefits of a dedicated ski-mountaineering suit. Not only was I sweating profusely, but I had a hard time getting my skins to stay put inside the front of my windbreaker on the descents. • There were a number of sections of boot-packing on the up-hills. I felt that I really struggled on these compared to the sections of skinning. The pre-kicked steps were generally far enough apart that considerable leg strength was required. Given that slogging up snow slopes is pretty much my greatest skill as a climber, I had hoped to be stronger with my skis off. Eric and I before the race. We had a friendly roommate rivalry and were close for much of the race. In the end, Eric beat me by 50 seconds. • I think that it would be worthwhile to ski the course (or at least the descents) before the race. Although the course was always well marked, I still found it difficult to focus on skiing while still keeping an eye on the red flags. At one point, I actually skied slightly off course even though there was a marshall there clearly directing me in the right direction. I also often skied more conservatively than necessary because I didn’t know what was coming up around the next corner or what the snow was going to be like. • The race was extremely well organized and the course was excellent. There’s no reason that ski-mountaineering races shouldn’t be both well-attended and competitive in Canada. Having high quality races like the Dogtooth Dash is a good start. • A short video that gives the flavour of the race can be seen here. Hey Scott, with tech bindings you need to pop your toe out to switch the heel to tour mode (I’ve seen people lever their heels out with a pole but it seems like a bad idea with 120g race bindings that cost 800$). Also, people typically use skinny skins with a bungee on the front and no tail attachments, so it’s pretty important to make sure the skin is straight and well-adhered to the base. I’ve skied with some telemarkers who put their skins on with their skis on, but they generally make it look like an awkward balancing act. I’m told that people who have it dialed can go from down to up (taking off their skis) in 40 seconds, and up to down (skis staying on) in 20 seconds.